If you were to believe everything you read in the press you would assume that ‘brown furniture’ is dead. This is not entirely true. Prices for Robert ‘Mouseman’ Thompson furniture have, in fact, never been higher. The combination of the clean and elegant lines, the superb construction quality and the very popular light oak colour, it is clear to see why there is so much demand for Mouseman furniture. Prices continue to rise each year as many first generation buyers (those who bought the furniture direct from Kilburn earlier in the century) are placing their pieces of Mouseman on the market as they downsize. Demand is now so high for Mouseman furniture that the factory in Kilburn has a long waiting list for new orders which has resulted in higher prices at auction as customers look elsewhere. This trend is set to continue which makes the current market a great opportunity for you to sell your Mouseman furniture. 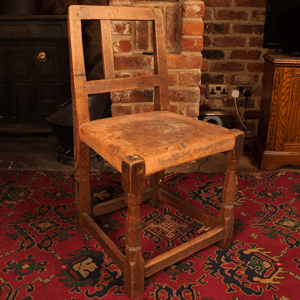 We can advise the value of your Mouseman furniture and help you find the best place to sell it, be at a specialist saleroom or direct to a collector. Best of all we take care of all the logistics and administration too. 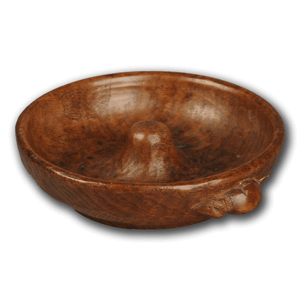 So if you have an item of Mouseman and you would like a valuation please contact us for more information. The colour of your Mouseman furniture has a big impact on the value. The best prices are reserved for very deep, golden colours. These colours are often only found on the very earliest pieces from the 1940’s and earlier. Items that have been bleached by the sun are worth less. 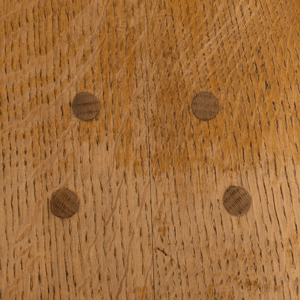 Mouseman dining tables and chairs have been a staple of the Kilburn workshop for decades. 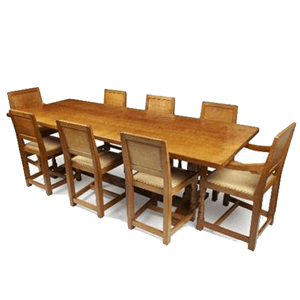 The shape of the Mouseman refectory dining tables has not changed much and age and size affects value. 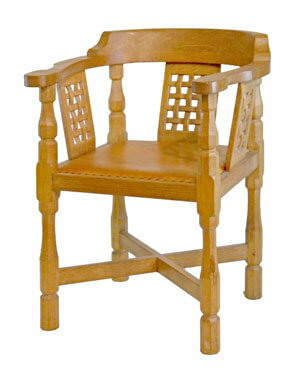 Lattice back chairs are worth more than panel back chairs. 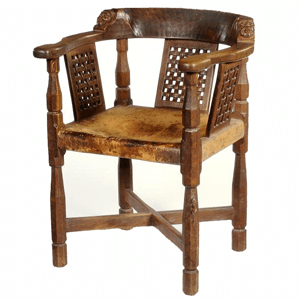 Carver or elbow chairs are also more expensive. Mouseman monks chairs, coffee tables, magazine racks, bureau, and lamps are all very commercial. As they can be added to an existing room rather than forming the centre of a room (as with dining tables) people can add lots of pieces to their collection. The age of your Mouseman furniture has a big impact on value. The highest prices are paid for items made by Robert Thompson in the 1930’s and 1940’s. We can date your furniture by looking at the construction and how the piece was made. Look out for our new guide on this subject. The condition of your Mouseman furniture is important. Splinters and splits are hard to remedy so reduce the value of your item considerable. Water damage, fading and light scratches can all be remedied by an experienced craftsman, or even back at Kilburn. Each Mouseman mouse takes around 45 minutes to carve. The identity of the carver is not so important, rather the character of the mouse itself. 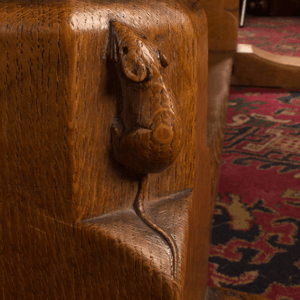 The mouse in the image above is a lovely, well carved and well-positioned mouse. It may not add to the value per se but does increase how commercial the item is. We’re one of the only independent advisors in the antiques industry. We can help you sell your Mouseman for the highest possible price and at no extra cost to yourself. If you have a collection of Mouseman you may be considering selling at auction. This can be one of the best ways to sell your collection. However, not all auctions are equal though so care must be taken when considering which auction to use. The use of ‘the internet’ is not the universal leveller that many salerooms will lead you to believe. We can make a personal introduction to the best saleroom based on your location free of charge. 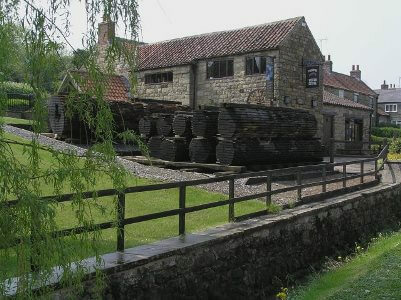 You can then be assured your collection of Mouseman will sell for the highest possible price. We can also negotiate private sales which save you considerably in commission. Private sales can also be completed much swifter and you will get paid a lot quicker than auction. If you would like a free, no obligation valuation of your Mouseman furniture please use the form below. You can also email details about your furniture to [email protected] or call us on 01270 440357. Thank you for your message. We will contact you within 48 hours.